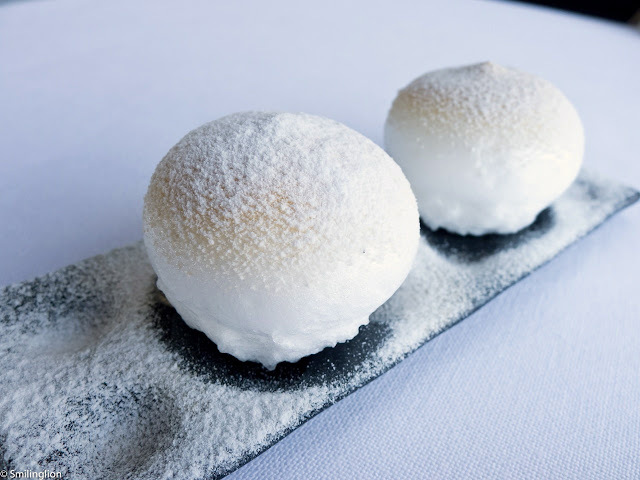 When we made our holiday bookings for Spain, it was our wish to dine at both Sant Pau and El Cellar de Can Roca, two of the five 3 Michelin-starred restaurants in Spain. 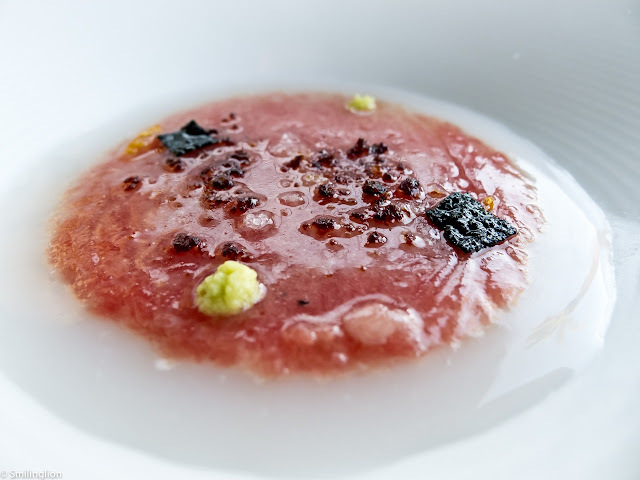 However, though we were able to get a table at Sant Pau 3 months in advance, we were told by El Cellar that their tables in October were already booked way in advance (9-12 months they said). 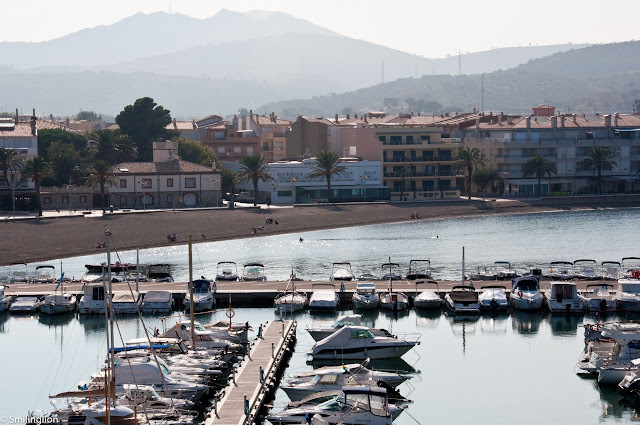 So we went looking for another place where we could have a nice lunch during our second day in the Girona/Costa Brava region. From our search, we came across a very low profile and rather obscure 2 Michelin starred restaurant in the northern-most part of Catalan, almost by the French border: Restaurant Miramar. It was quite a drive, about an hour from Girona (where we spent the morning sightseeing), and just when we were about 30 km from France, we arrived at the very tranquil and sleepy seaside town of Llanca. To describe this town as 'sleepy' would be an understatement. We must have seen no more than 30 people in the town, of which 8 were going to the same restaurant as us (and the rest were sunbathers). Perhaps as we were there in the afternoon, most of the townsfolk were on their extended siestas and wouldn't come out till the evening. 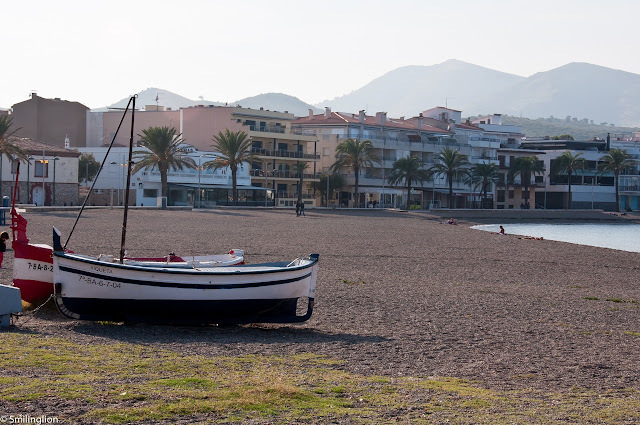 Nonetheless, the place had a very peaceful feel about it, and we took a slow walk around the beach undisturbed by nothing more than the sound of the waves and the seagulls. 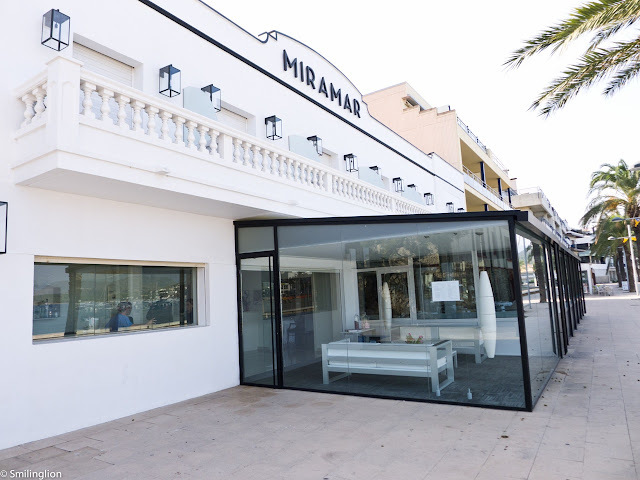 Restaurant Miramar is housed in an art deco building almost at the foot of the sandy beach. It has been owned by the same family since 1939 and in 1997 the kitchen was taken over by the current chef, Paco Perez. Unfortunately for us, Chef Perez was in Boston at that time and so we did not get to meet him when we visited his restaurant. 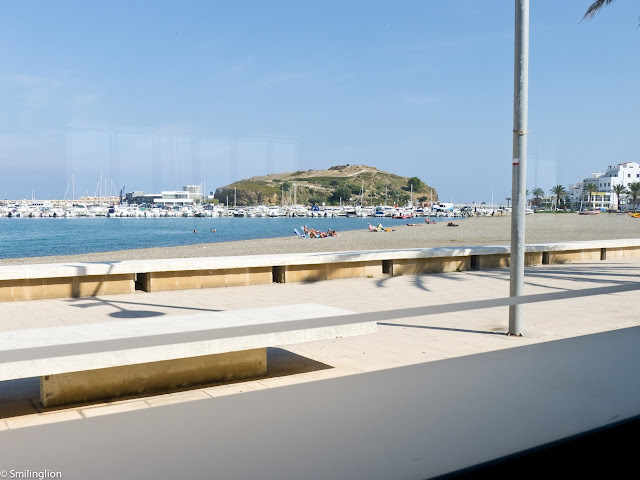 We were given an excellent table by the window, where we could take in the sea-views during our meal. 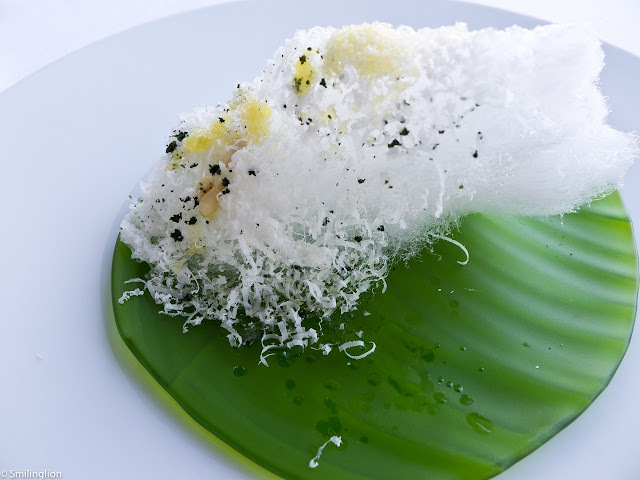 Months ago, when we made the reservation by email, we had been asked if we wanted the tasting menu (to which we said yes), so there was no need to make any food orders this time. For wine, we asked the sommelier to choose a bottle of white wine for us, to which he duly opened a Catalan white which was spectacular. To his credit, the wine went well with our entire meal and when we got the bill, it only cost EUR23, which was a pleasant surprise for us. The tasting menu was so long and so after a while it all became a blur. 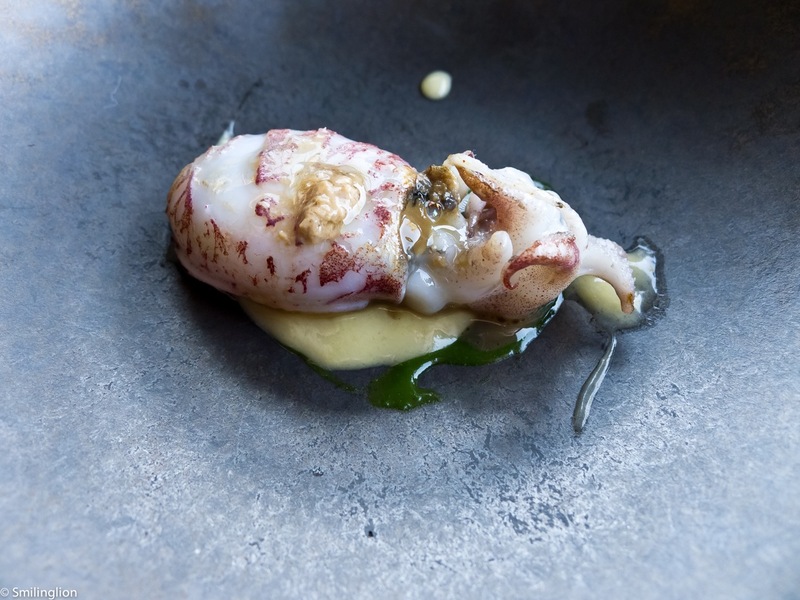 In addition to seafood being the emphasis of the food here, what we noticed was that there was also a very heavy Japanese influence in many of the ingredients used. 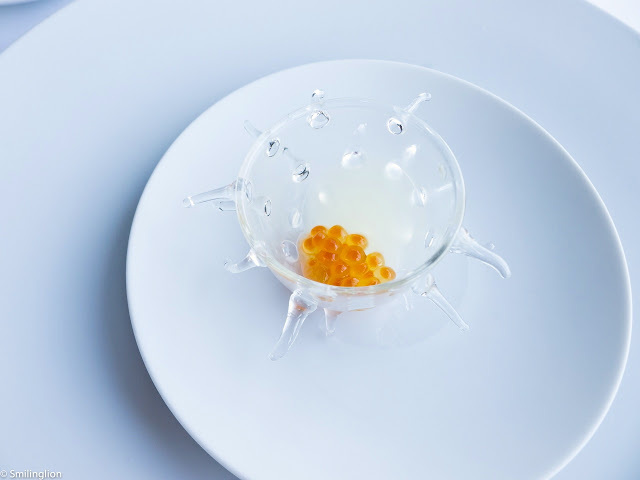 Lemon, miso and salmon caviar: This was clever, the egg roe and miso went naturally together but the lemon with its zing managed to improve the flavours. 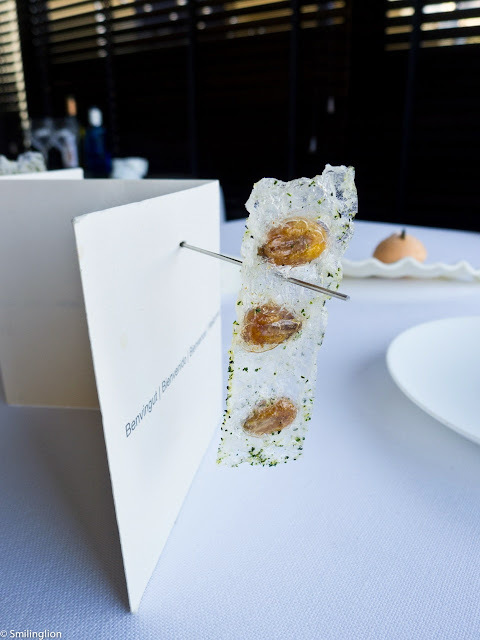 "Quicos" and coriander: This was corn kernels and coriander made into a thin crisp. It was quite tasty. 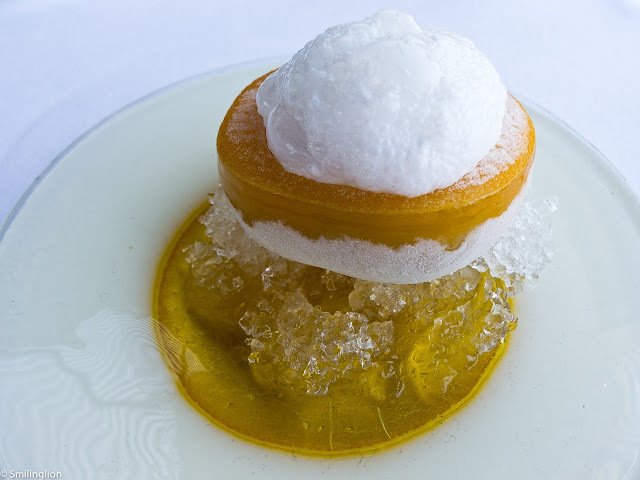 Pumpkin: This was pumpkin cubes in pumpkin foam, and was pleasant. Pumpkin: We liked the pumpkin meringue. Mochi of rice "a la cubana": Made of rice but with the sponginess and slight stickiness of Japanese mochi, this was interesting and enjoyable. 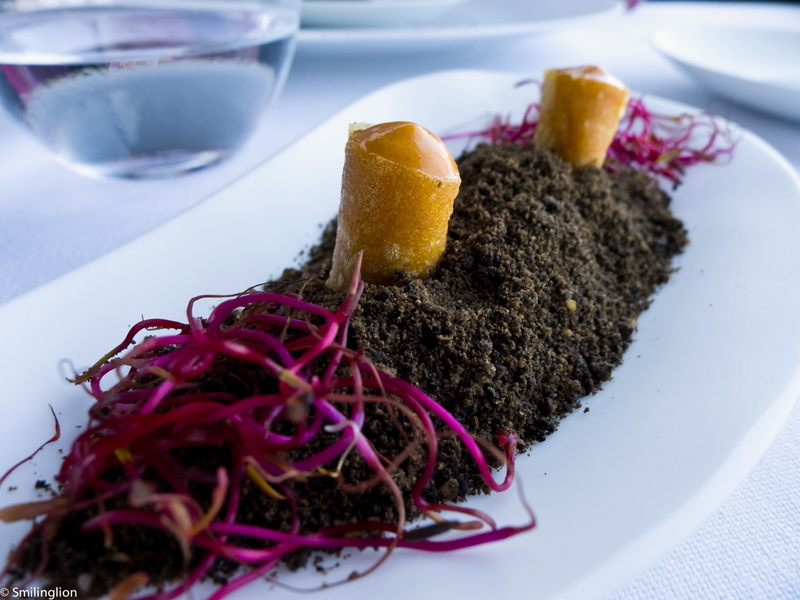 Tiger mussel: This was a deconstruction of the raw tiger mussel. It didn't work for us. 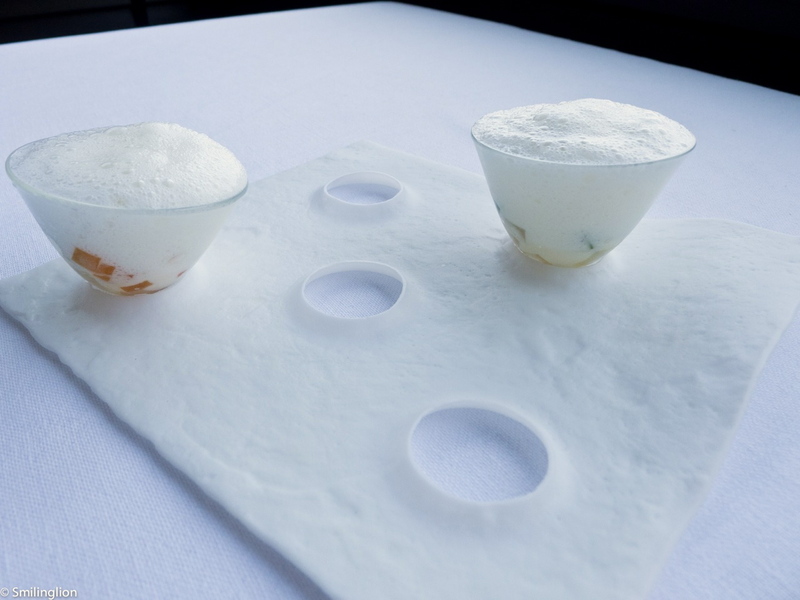 Soufflé potatoes and "Salmorejo": The salmorejo is a Southern Spanish tomato cream, and in this case, the salmorejo was enclosed by a crispy potato soufflé, and perched on a bed of edible 'soil'. It was quite nice. 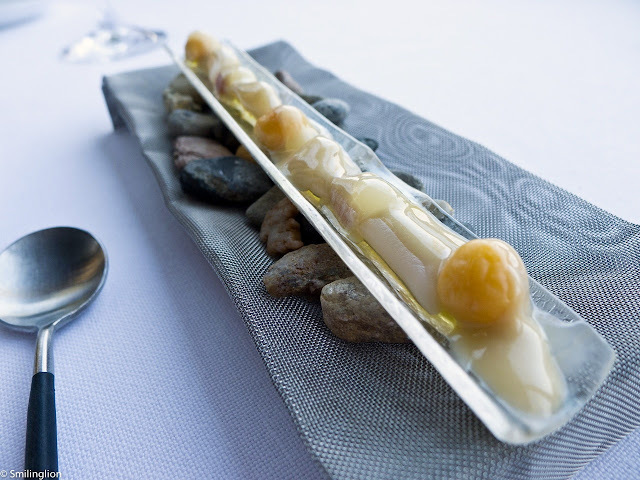 Razor clam and chickpeas: The razor clam here was similar to the one we had at Tickets a few days earlier. 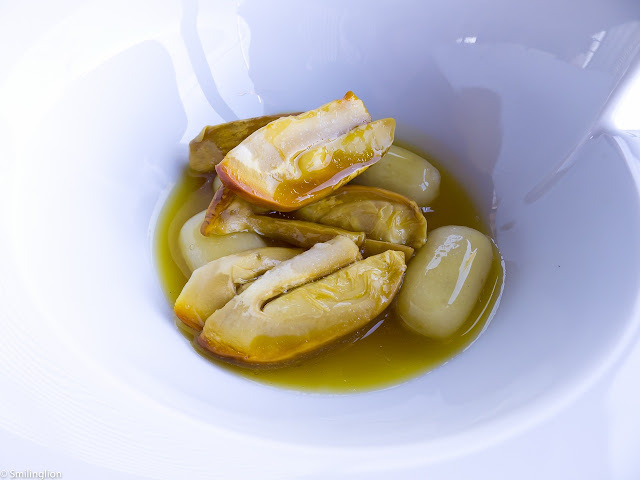 We didn't like this one either as the clams were chewy and the sauce was slightly sour. 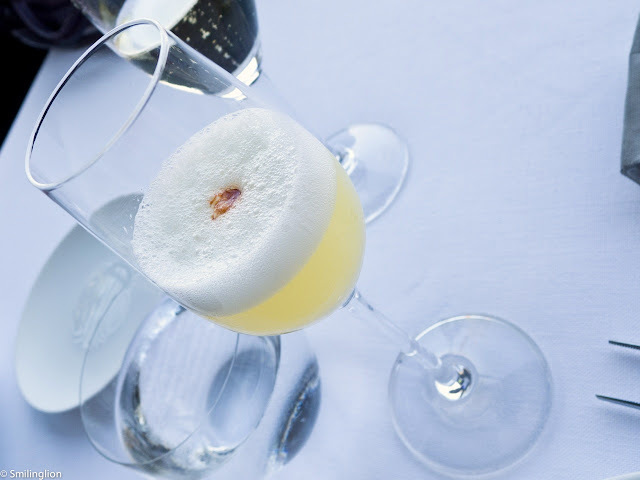 Pisco: A 'sour' like the one we had at Sant Pau, this was refreshing. Grouper and fried skin: This was delicious (and tasted like the keropok (fish crackers) we get back home). We loved the potatoes too. 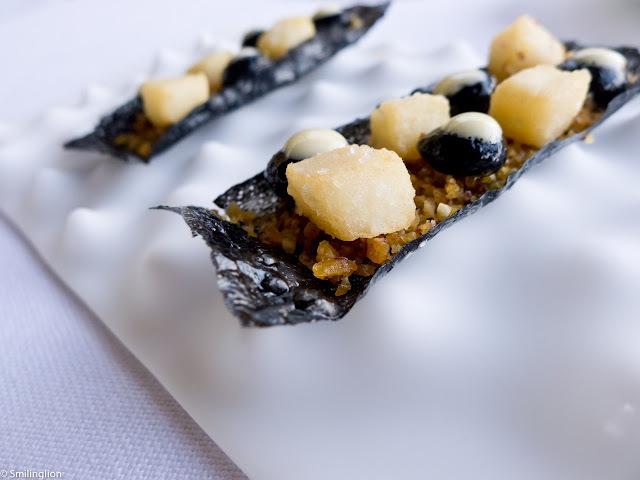 Andaluza squid: This was squid served on a very innovative and thin sheet of dried squid ink. We thought it was good. Fish and chips: Very long and thin strips of breaded whitebait (we think) which were quite nice. 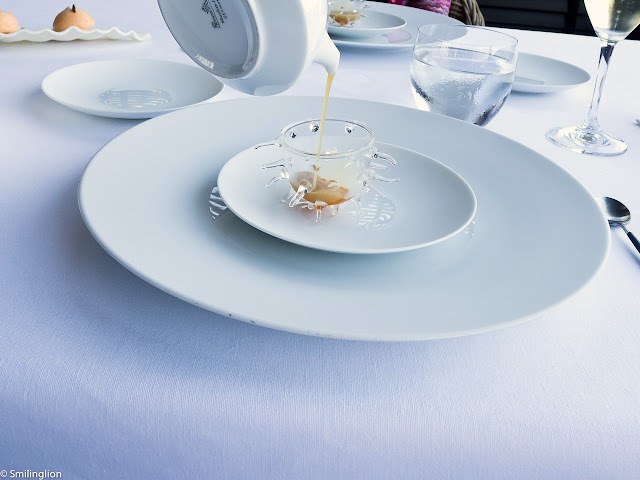 However, we thought that this dish was very casual and seemed out of place with the rest of the meal. 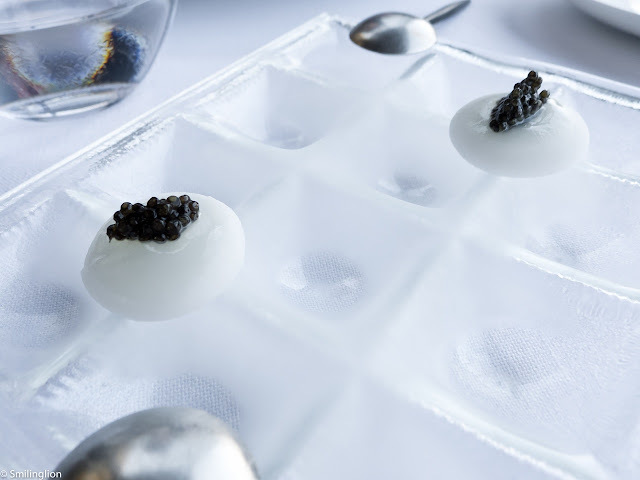 Lemon and caviar blini: A very good dish, it was caviar on the top of a lemony sphere (but it wasn't so sour as to overpower the taste of the caviar). 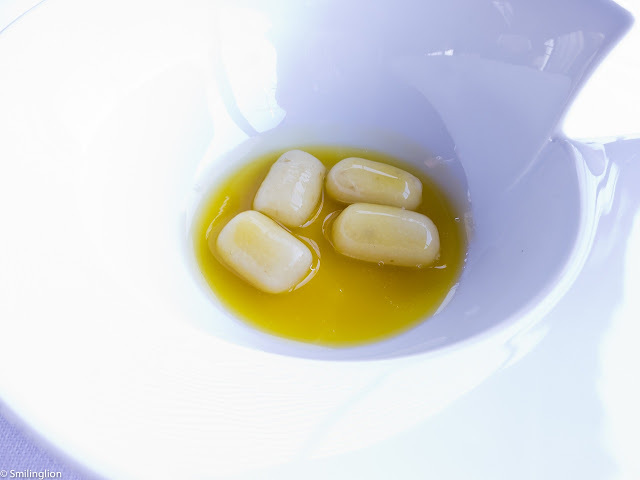 Fresh almond: This was a very small dish. 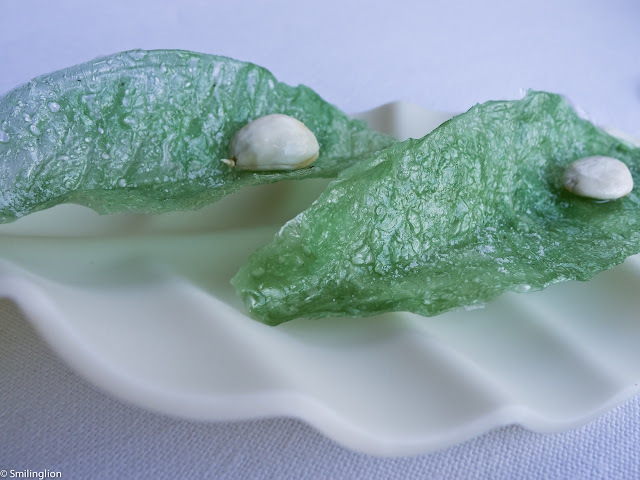 It was an almond on a thin crisp made of almond and made to look like a leaf. 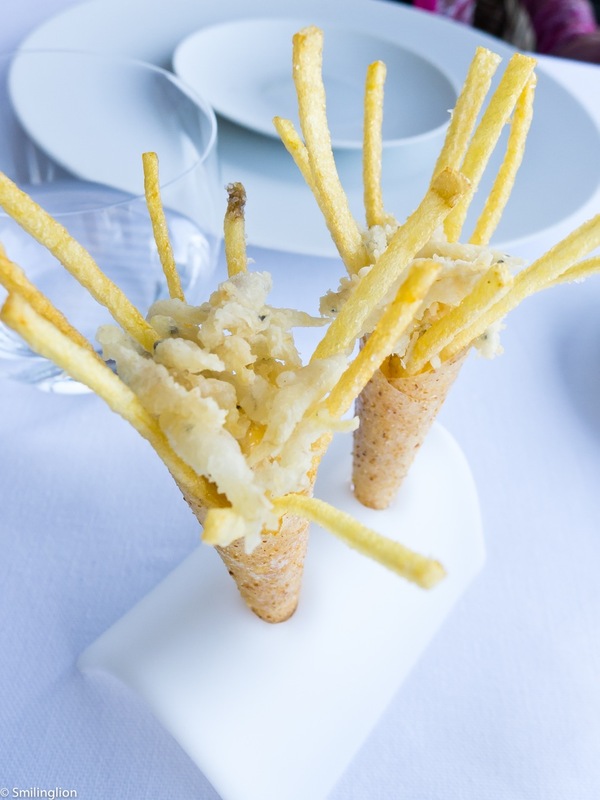 Nice but more suitable for an amuse bouche and not halfway through a meal. Pesto: This was cotton candy but with pesto instead, and with shaved cheese to give flavour. The texture was interesting but the flavours didn't really come out for us. 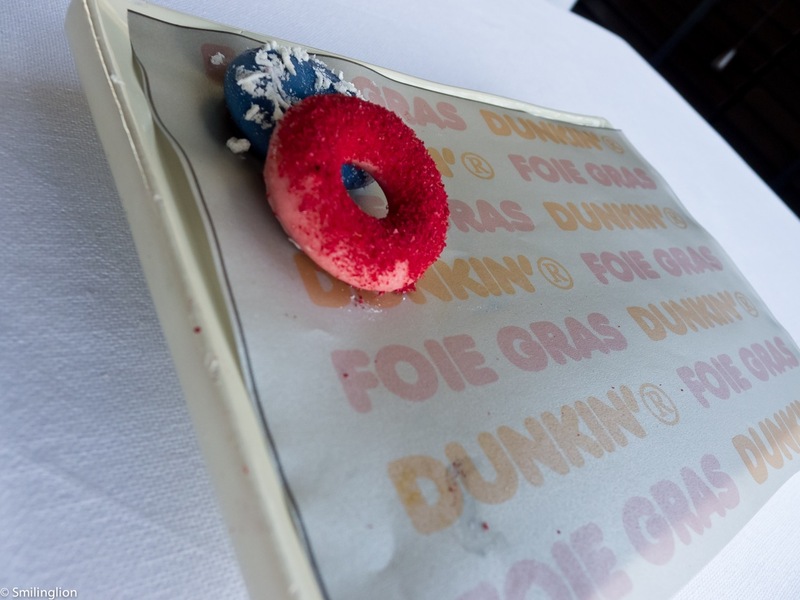 Dunkin' foie gras: Two of our favourite things (donuts and foie gras). No wonder we loved them. Persimmon: Another weird dish in the middle of our meal, this was a poached persimmon with foam and on a bed of ice. It reminded us of cheng tng, a local dessert of ours. We didn't enjoy this. 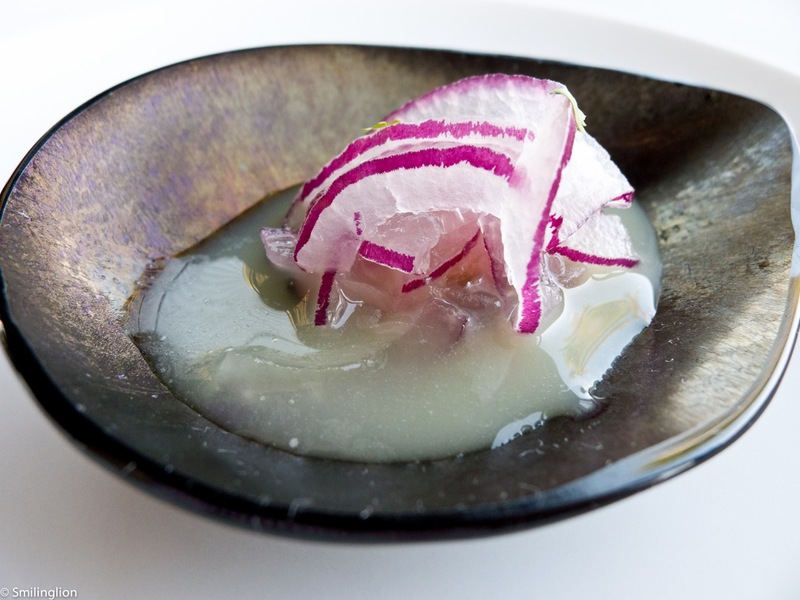 Nigiri: The thin disk of pounded tuna belly (negritoro) was delicious, but was totally Japanese and it was strange eating this in an obscure part of Spain. 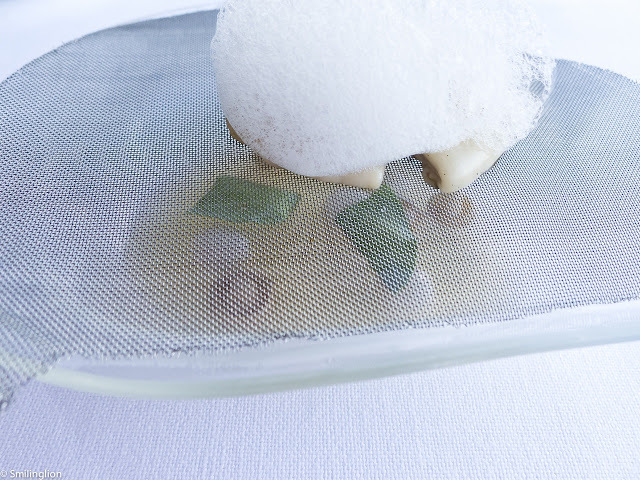 Oyster: In this dish, the poached oysters were placed on a metal grill, and covered with oyster foam, the grill drained the juices from the oyster into a bowl which had an assortment of mushrooms and jelly, creating a kind of oyster consomme. 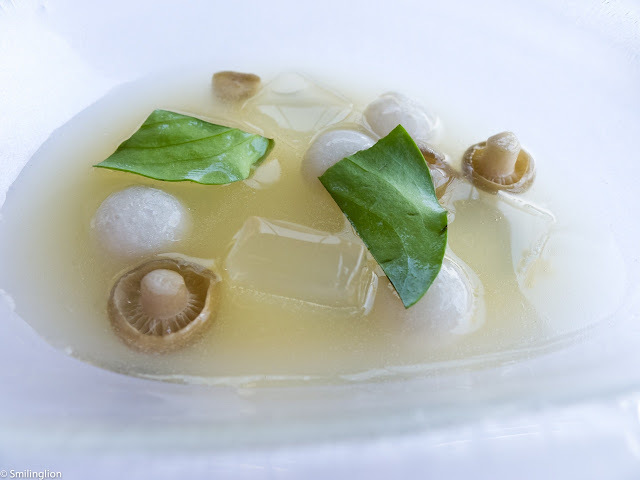 It was a unique idea but both the oyster and consommé were rather tasteless and the dish didn't really come off well. 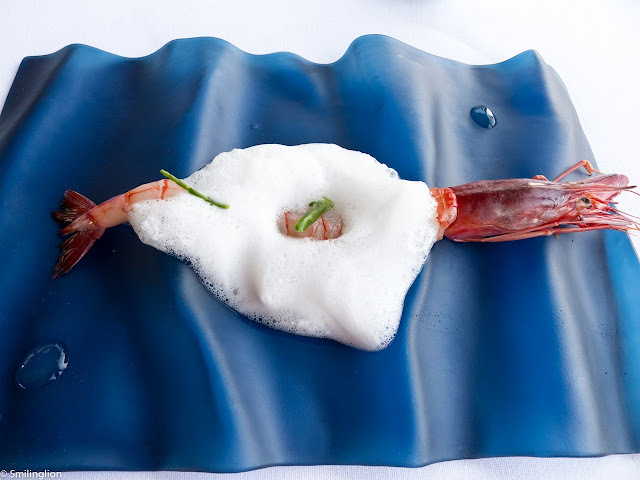 Marine king prawn: This was raw prawn and the foam was something very briny which simulated the taste of the sea. It was nice and we wished there was more than one prawn on the plate. 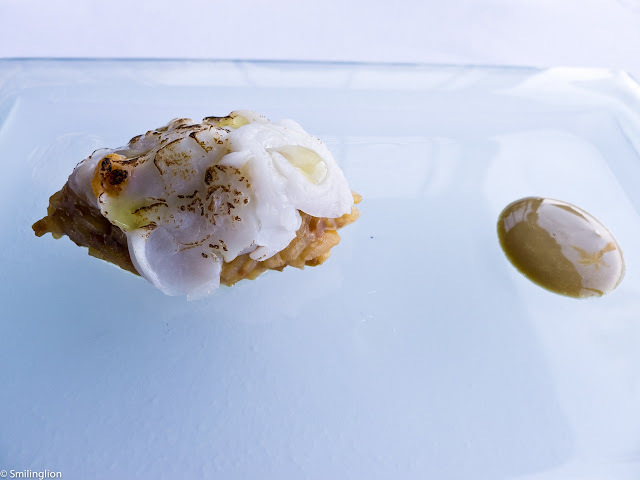 Cuttlefish "a la brutesca": We loved this. 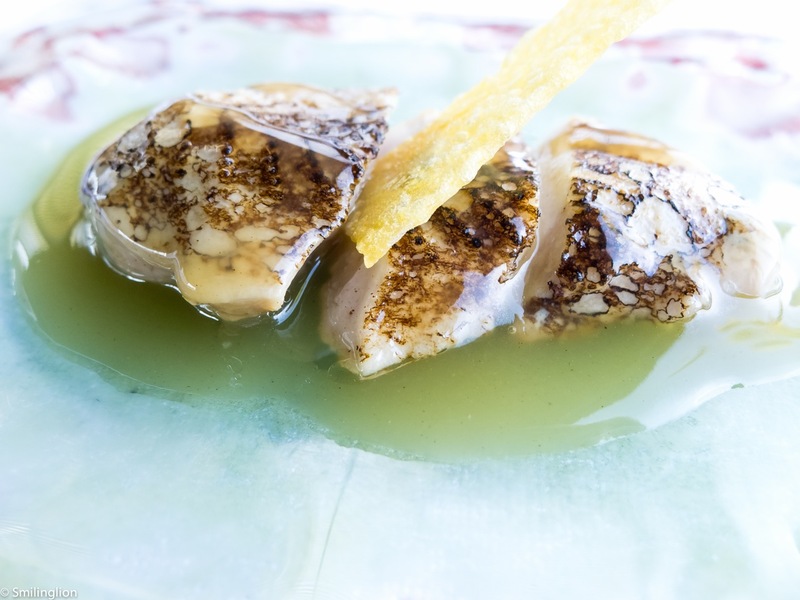 It was a very raw baby cuttlefish which was very lightly grilled, and was to be eaten in one mouthful. 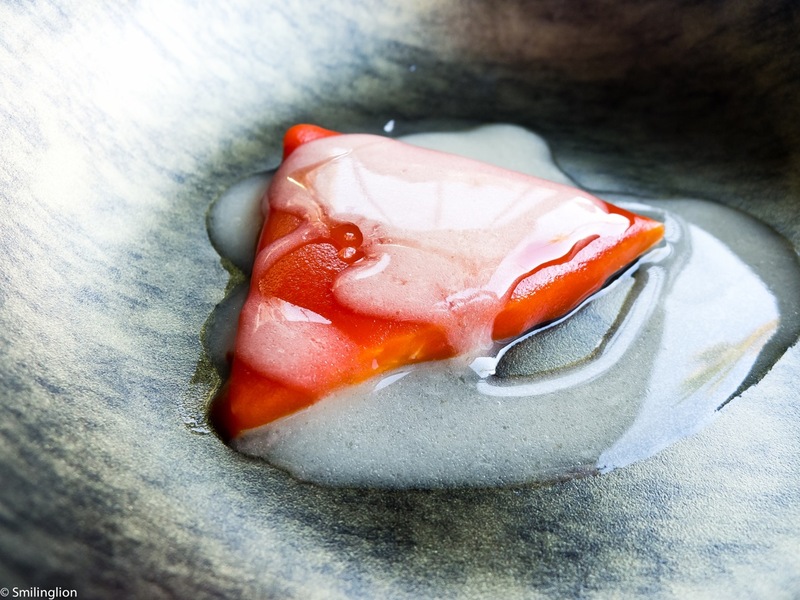 "Piquillo": This was a thin layer on red pepper on top of a similarly thin layer of cod fish. It was very good. Caesar's mushroom: A very simple dish of gnocchi and an unusual mushroom. It was quite nice. 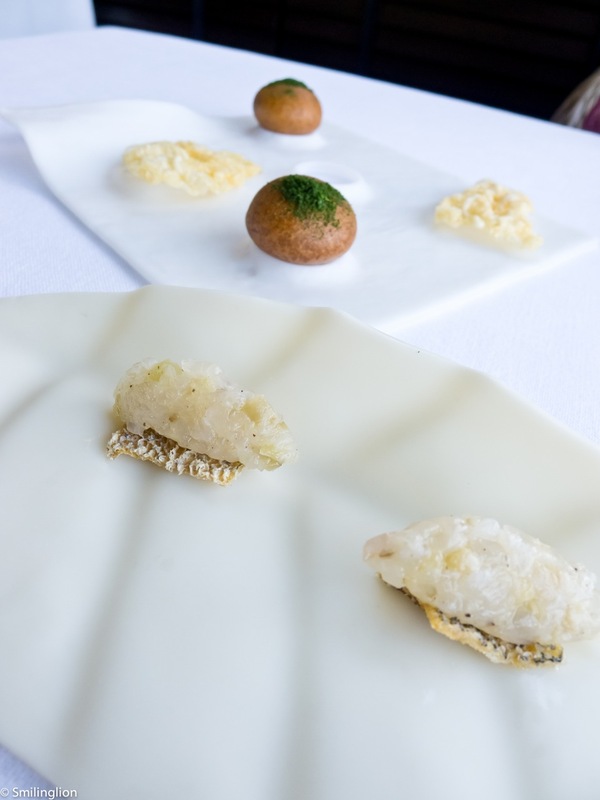 Spiny lobster rice: The grilled lobster atop a handful of paella 'a la sushi' was excellent. 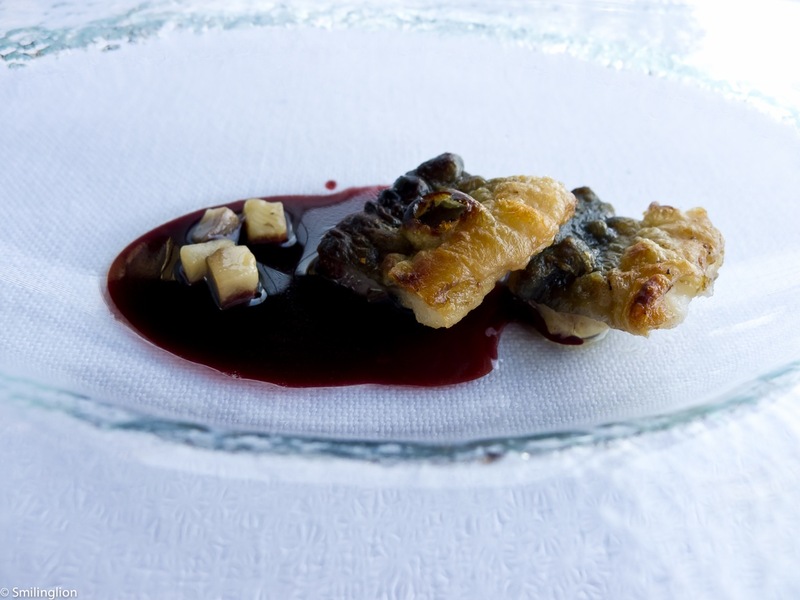 Matelotte eel: The eel was nicely grilled, though we found the sauce too sweet and overpowering. 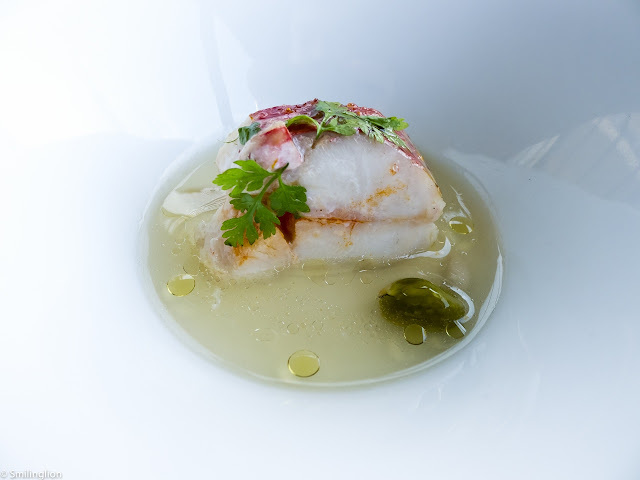 Red mullet and "potaje": A clean tasting and perfectly cooked piece of fish, the mullet retained its springy texture and juices well. A very good dish. Ast quail: We were very disappointed with this quail dish. The quail was tasteless and the sauce was strangely sourish. Up to this point, we were feeling quite mixed about our meal. Some of the dishes were clever and some quite good, but there were a fair number of rather disappointing ones as well. Fortunately, desserts were on their way and they really turned our meal around. 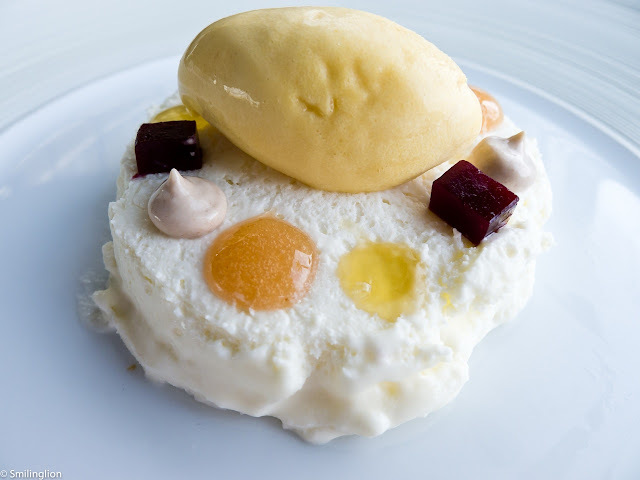 Cheese cake of Payoyo: This was a mix of the cheese and dessert courses. The Payoyo is a Spanish goat cheese and its mild taste and creamy texture made for a perfect cheesecake. We loved this. 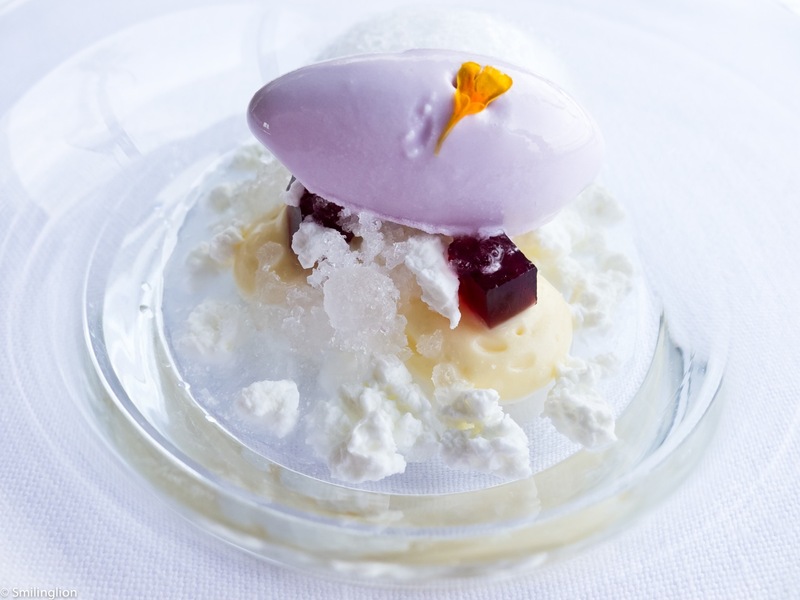 Flowers: This was different flowers presented in six different ways (foam, ice cream, custard cream, whipped cream, granita, jelly). It was very fragrant and refreshing, and very good. 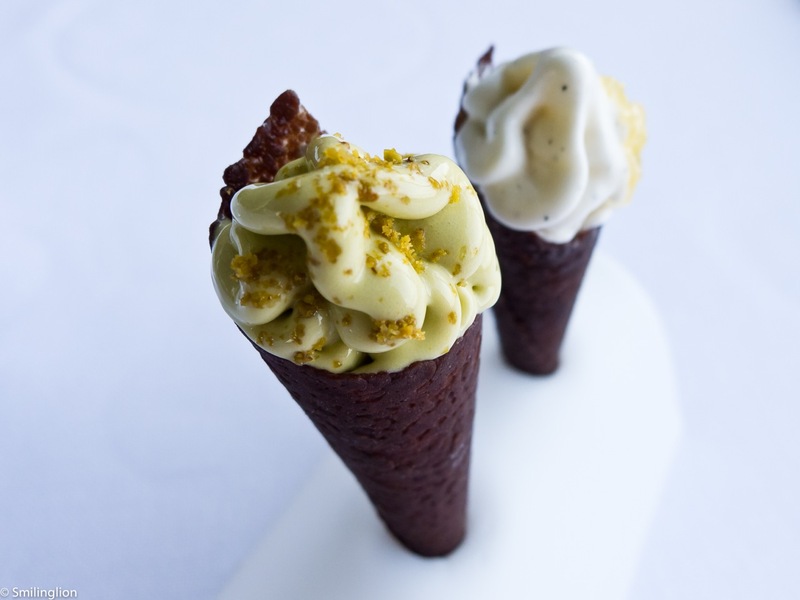 "Cornetto": And finally, we were presented with two small chocolate cones of pistachio and vanilla bean ice cream, which was a great dessert on a hot sunny day by the beach. 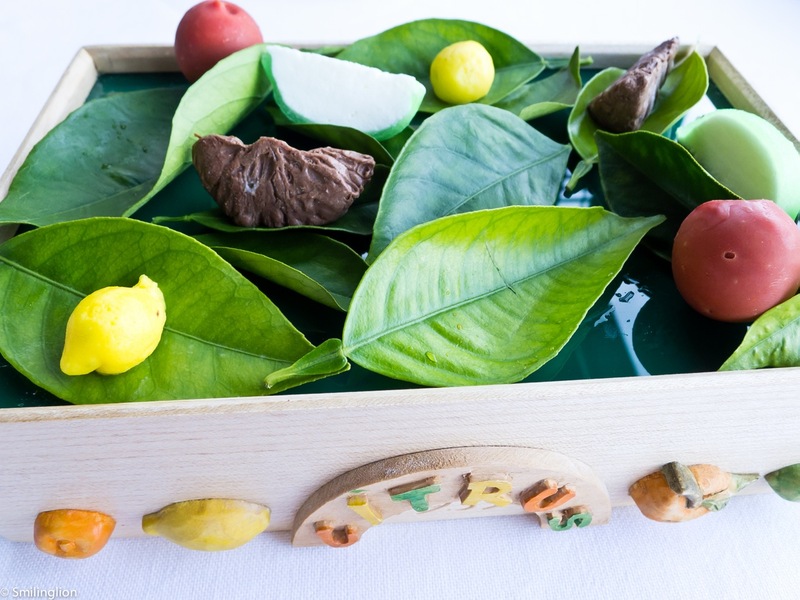 Citrus box: Not to be outdone, the mignardises was very interesting. This was a box of chocolates with different fruit coatings. 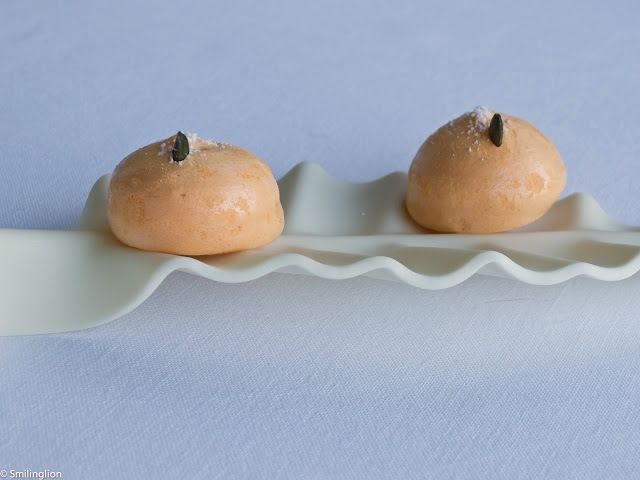 It was one of the more memorable mignardises we have had. Final Thoughts: Our meal at Miramar was very enigmatic. For a two Michelin starred restaurant, we felt that some of the dishes were bizarre and we couldn't get around the fact that for almost half of the meal, we were served bite-sized items more suitable as pre-meal snacks. 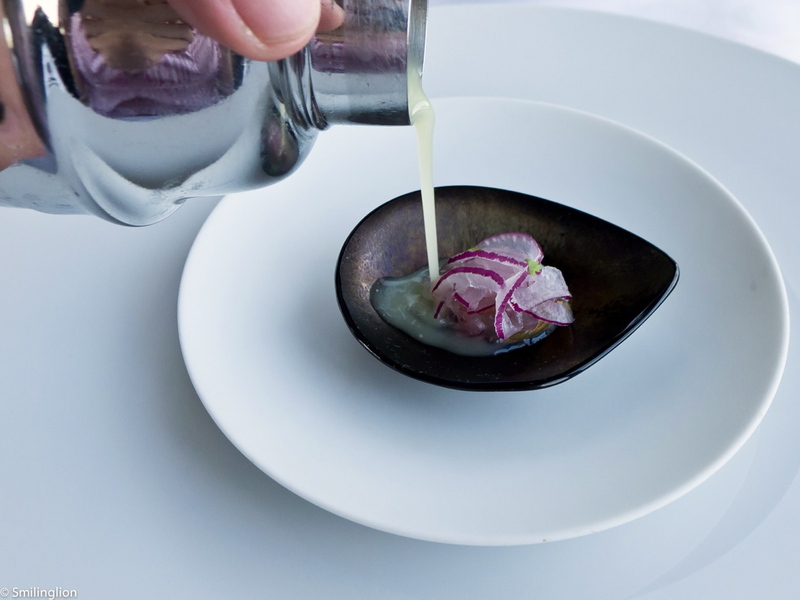 Though many of these were clever, it kept building our expectation for some amazing main courses which never arrived. In fact, we were only impressed when the desserts came out, as these were very good. We wondered if they were trying too hard with the tasting menu, to try showcase as many ideas as possible within a meal. The service and wines were excellent, and the views of the bay were gorgeous, but given the long drive to get there from Barcelona, we're not sure it will warrant a special trip to travel out of the way there again for another meal.